This short, although slightly steep trail, is a popular route that leads hikers and trail runners to a historic fire tower with 360-degree views. Devil’s Head is a devilish-looking peak in the Rampart Range. A short 1.5 mile trail heads up its flank to an elevation of 9,748 feet, and ends at the only Front Range fire lookout tower still in service. In 1907, the newly formed Forest Service envisioned seven fire lookouts along Colorado’s Front Range, from New Mexico to Wyoming. Four were eventually built, including Devil’s Head Lookout Tower, finished in 1912. It was initially a table and fire-finder bolted to a rock. Rangers had to climb a ladder to get to the top, and scout for fires on a rock outcropping. The station employed the first female fire lookout in the country – Helen Dowe, who started in 1919. The current tower was built in 1951, and it took 100 men and 71 mules in its construction. Today, the lookout is manned in the summer months; lookouts can easily spot fires as far away as 75 miles. This trail is popular, so if you're seeking solitude, this may not be your best bet. But even with the crowds, its views, its classic lookout and boulders frosted with thousands of ladybugs will make the trip memorable. Start at the Devil’s Head Campground in the South Platte District of the U.S. Forest Service. A bench and interpretive display mark the trailhead, and there are benches along the way with views. At the top of Devil’s Head, the trail opens into a grassy area below the tower that makes for a perfect picnic spot. Anyone looking for a challenge - this is a short, steep trail, but it’s worth the effort. 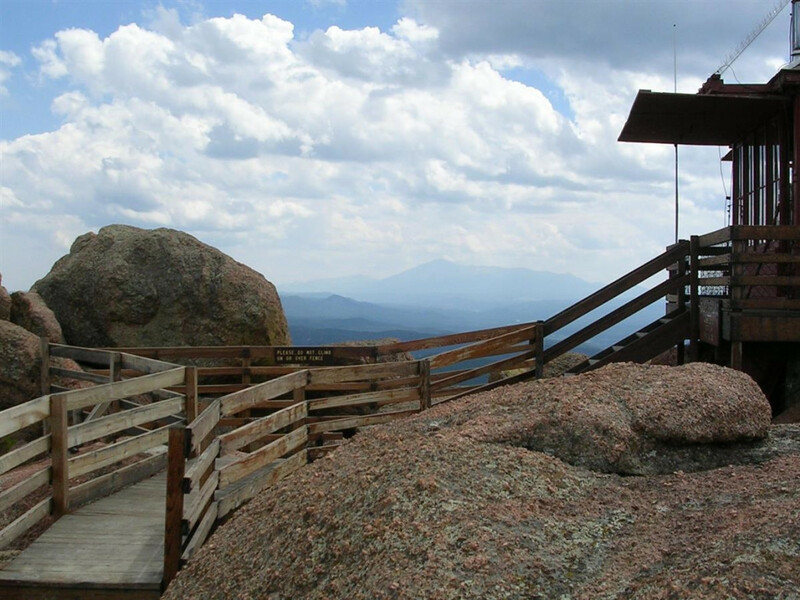 At the top, there are 143 metal steps to the tower itself, which gives hikers a 360-degree view of the Pike National Forest. The lookout is on top of a rock outcropping in the Rampart Range. From Sedalia along U.S. Highway 85 south of Denver, take Colorado Highway 67 west for 12 miles to Rampart Range Road. Stay on Rampart Range for 11 miles and watch for the turnout for Devil’s Head Lookout and Campground. Follow the signs and veer right to the trailhead. The trail is only open from mid-May through mid-September, depending on snow and road conditions. (Get the latest information from the Forest Service website).